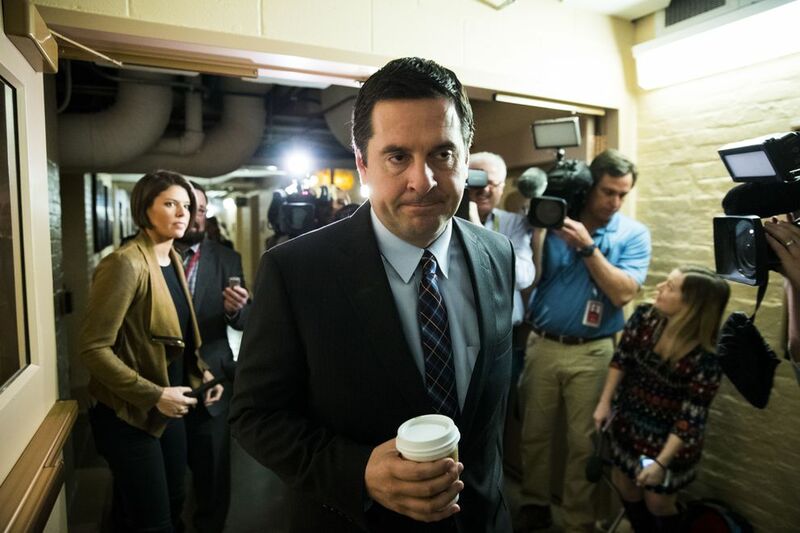 WASHINGTON — A pair of White House officials played a role in providing Rep. Devin Nunes of California, the Republican chairman of the House Intelligence Committee, with the intelligence reports that showed President Donald Trump and his associates were incidentally swept up in foreign surveillance by U.S. spy agencies. The revelation that White House officials assisted in the disclosure of the intelligence reports — which Nunes then discussed with Trump — is likely to fuel criticism that the intelligence chairman has been too eager to do the bidding of the Trump administration while his committee is supposed to be conducting an independent investigation of Russia's meddling in the last presidential election. The congressman has refused to identify his sources, saying he needed to protect them so others would feel safe coming to the committee with sensitive information. He first disclosed the existence of the intelligence reports March 22, and in his public comments he has described his sources as whistleblowers trying to expose wrongdoing at great risk to themselves. Several current U.S. officials identified the White House officials as Ezra Cohen-Watnick, the senior director for intelligence at the National Security Council, and Michael Ellis, a lawyer who works on national security issues at the White House Counsel's Office and formerly worked on the staff of the House Intelligence Committee. Cohen-Watnick is a former Defense Intelligence Agency official who was originally brought to the White House by Michael T. Flynn, the former national security adviser. The officials said that earlier this month, shortly after Trump wrote on Twitter about being wiretapped on the orders of President Barack Obama, Cohen-Watnick began reviewing highly classified reports detailing the intercepted communications of foreign officials. Officials said the reports consisted primarily of ambassadors and other foreign officials talking about how they were trying to develop contacts within Trump's family and inner circle in advance of his inauguration. The officials spoke on the condition of anonymity to describe the intelligence, and to avoid angering Cohen-Watnick and Ellis. Officials say that Cohen-Watnick has been reviewing the reports from his fourth-floor office in the Eisenhower Executive Office Building, where the National Security Counsel is based. But the officials' description of the intelligence is in line with Nunes' own characterization of the material, which he has said was not related to the Russia investigations when he first disclosed its existence in a hastily arranged news conference March 22. According to Nunes, he received a phone call from a source the night before, and then rushed to meet them on the grounds of the White House. He has explained the choice of location by saying he needed access to a secure location where people with security clearances can legally view classified information, although such facilities can also be found in the Capitol building and at other locations across Washington. The next day, Nunes gave a news briefing at the Capitol and then returned to the White House to brief Trump on the information. Nunes and Rep. Adam Schiff of California, the top Democrat on the committee, have held dueling news conferences in the days since Nunes' revelations, fueling criticism that the committee is unable to conduct a serious, bipartisan investigation. The chaotic situation prompted the leaders of the Senate intelligence committee, which is running its own investigation, to bluntly state Wednesday that their work had nothing to do with the House inquiry. And television news programs have been dominated by arguments about whether the incidental intelligence gathering of Trump and his associates was the real issue or simply a distraction from the Russia investigations. Nunes has acknowledged that the incidental intelligence gathering on Trump associates last year was not necessarily unlawful. U.S. intelligence agencies typically monitor foreign officials of allied and hostile countries, and they routinely sweep up communications linked to Americans who may be taking part in the conversation or are being spoken about. The real issue, Nunes has said, was that he could figure out the identities of Trump associates from reading reports about intercepted communications that were shared among Obama administration officials with top security clearances. He said some Trump associates were also identified by name in the reports. Normally, intelligence agencies mask the identities of U.S. citizens who are incidentally present in intercepted communications. Mark Mazzetti and Matt Apuzzo contributed reporting.